With the first big snowfall of the season predicted for today, my main activity was photographing the changing scenery. 8:48 AM Light snow has been falling ALL morning. 10:48 AM The grass is beginning to disappear. 6:06 PM Nightfall on the snowfall. 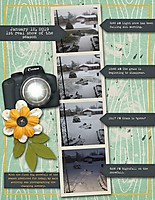 Great idea to photo the snow thoughout the day I like that you used a film strip type frame to showcase your photos and added the camera. 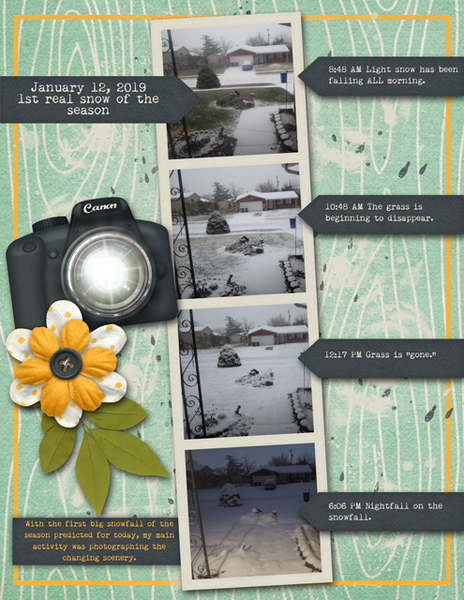 The filmstrip is great to show the progression of the snowfall over the whole day. Love the "snowfall" at "nightfall".